There must be a good reason why this is a star product. I just had to find out. I’ve been collecting new lip products for the past few months and I am enjoying this newfound addiction…to lip color. But like a lot of ladies, I don’t like the look of dry, fine lines on my lips. 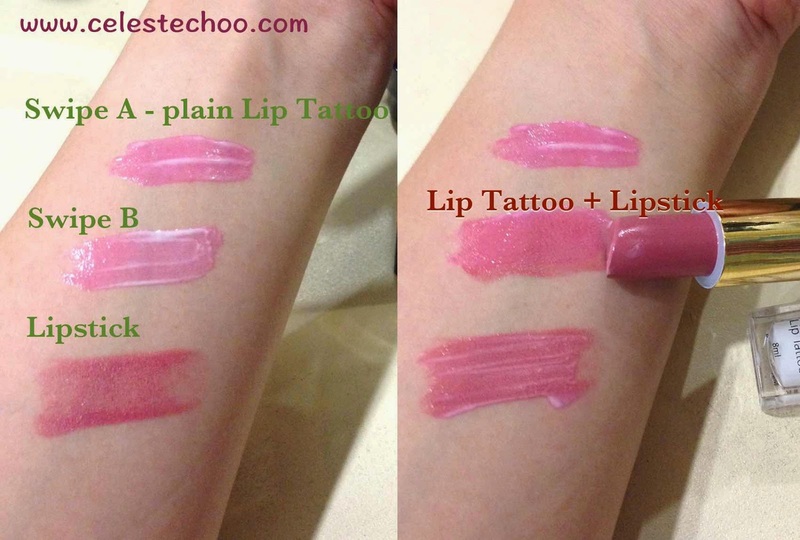 Some lipsticks are good enough to be worn bare but some need extra moisturiser before or after application. For those that feel a bit dry on my lips, I normally apply lip balm first then apply the lip color on top. But what if I can have a lip product that moisturises, gives rosy color and prevents fine lines on my lips all at the same time? 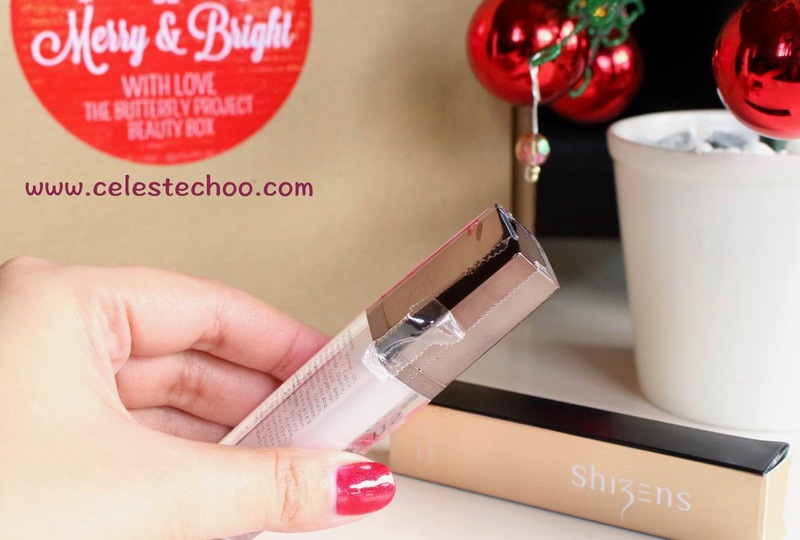 I was thrilled to receive the Shizens Lip Tattoo star product inside The Butterfly Project’s Beauty Box last month during our Christmas dinner. 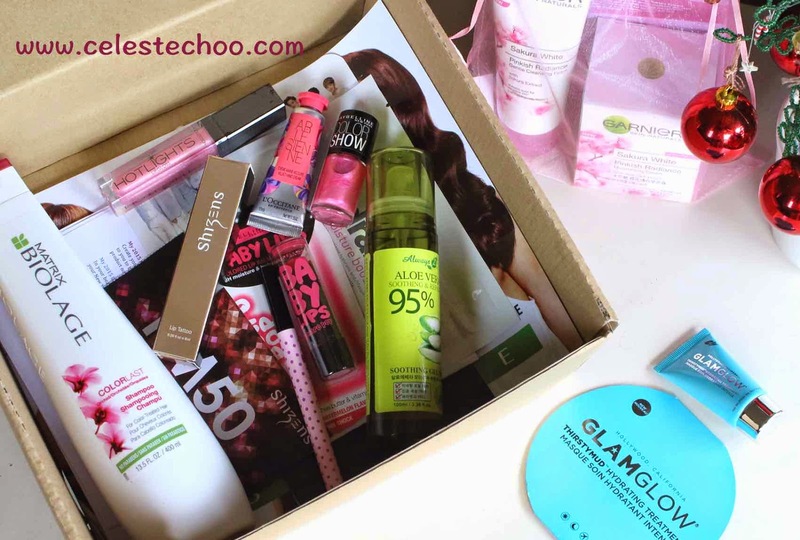 Love all the interesting items inside this box! This lip product has a sleek cap in metallic brown color while the tube itself is a mix of white and transparent plastic. Notice that after taking out from the tube, the applicator is white in color, hmmm, white lip color? You’ll see the magic of this tattoo in a short while. I decided to experiment with this lip tattoo. 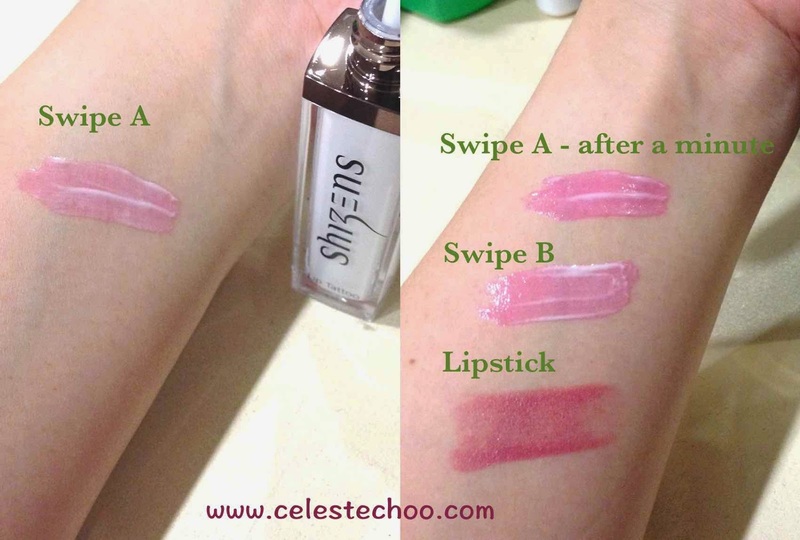 Upon applying the product, it shows white at first but immediately changes to a pinkish color (see Swipe A on the left). I wanted to see what difference in color it would have if I apply it under lipstick and on top of lipstick. 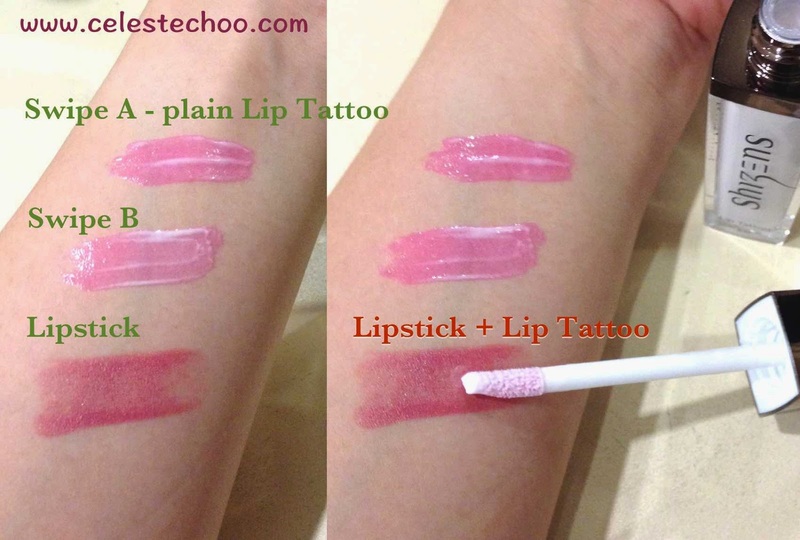 Different shades with 3 techniques: a) plain lip tattoo, b) lip tattoo with lipstick on top, c) lipstick with lip tattoo on top. The great thing here is you can see that the plain lip tattoo gives enough rosy color on my skin. In fact, it is not necessary to wear with lipstick at all! It’s good enough on its own. 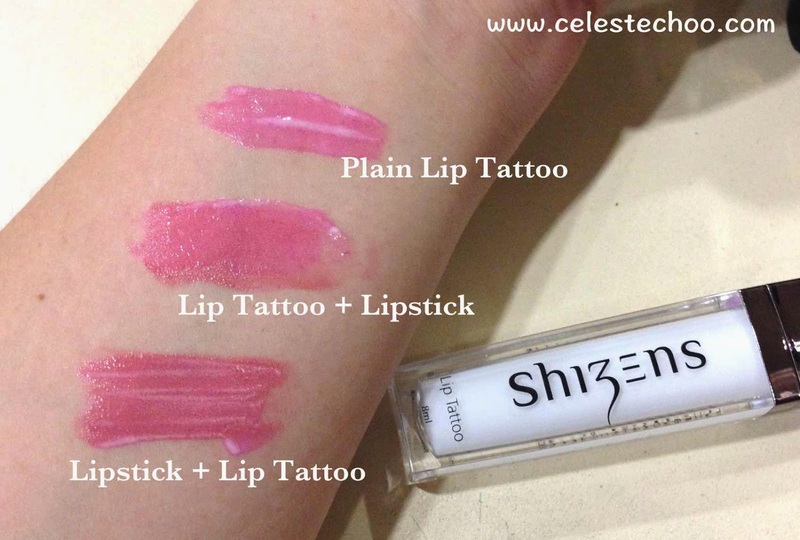 Of course, if you’d love a darker red shade, it will be great to mix your darker red lipstick with Shizens Lip Tattoo for that moisture boost, prevention of lines and long-lasting color. Why is it called Lip Tattoo? Yes, you’re right. Because it does stick to your skin or lips for a long time than normal lip colors do. Be warned…your lips will stay lovely with rosy tones for long hours. It actually took a day for those test swipes on my arm to wear off even after bathing a few times! Cool. I’m someone who needs lipstick and lip balm or butter most of the time. See how pale I look without lip color? See how dry my lips are? 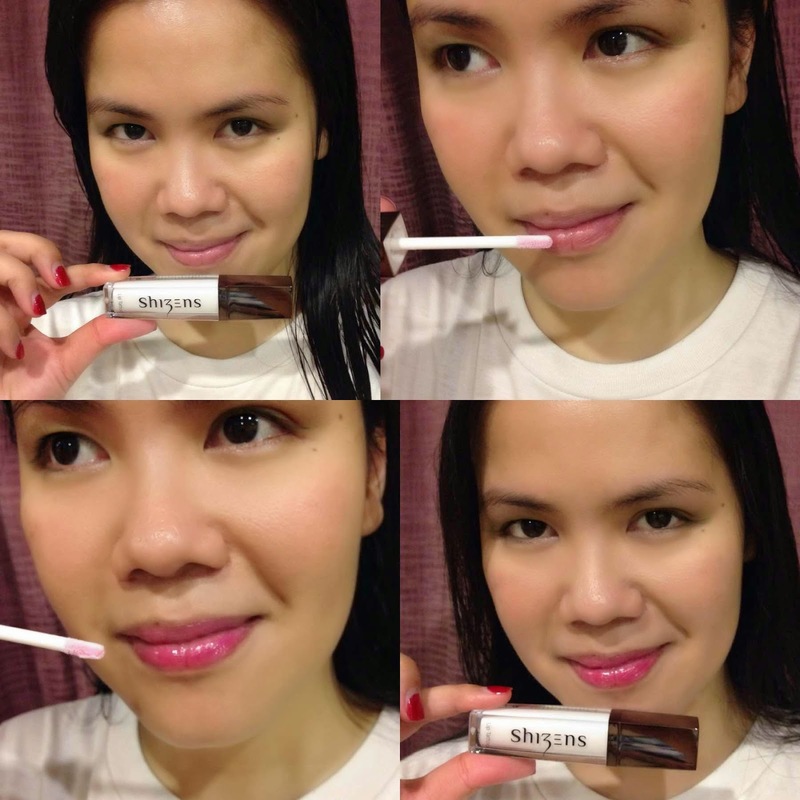 But a few swipes of Shizens Lip Tattoo made an immediate difference to the color and condition of my lips. The white product turned rosy in less than a minute (maybe it’s also because I’m hot, haha) and moisturized my lips in seconds. Love tattoo? Yes, I do.